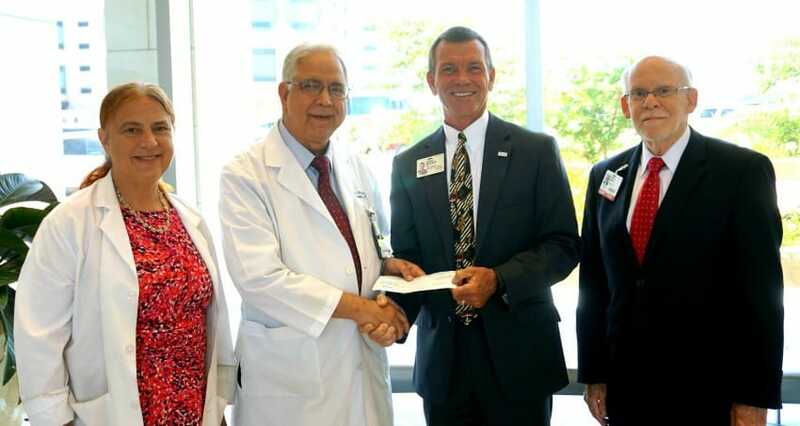 Paulette and Jay Mehta present a check to Lance Burchett, vice chancellor of Institutional Advancement, and James Marsh, M.D., chair of the Department of Internal Medicine in the UAMS College of Medicine. Aug. 15, 2017 | July 27, 2017 | Together, the husband-and-wife physician team of Jawahar L. “Jay” Mehta, M.D., Ph.D., and Paulette Mehta, M.D., have done much to drive the mission of the University of Arkansas for Medical Sciences (UAMS) through cutting-edge research and outstanding patient care. Now, they’re looking even farther ahead: the Mehtas have given $50,000, matched by UAMS for a total of $100,000, to establish an endowed lectureship to bring in top physicians in internal medicine to share their scientific knowledge with medical students and residents. Jay Mehta, professor of medicine, physiology and biophysics, holds the Stebbins Chair in Cardiology and is the former director of the Division of Cardiovascular Medicine. Paulette is a professor of medicine in the Division of Hematology/Oncology. The Mehtas have bridged their respective fields through research on platelets and other blood cells in cardiovascular disease. They’ve developed lasting relationships with their patients, treating them like family. With this new lectureship, the Mehtas plan to invite notable physician educators and scientists to visit UAMS. “This is our chance to pay back for all that we have been given, and to pass philanthropy on to future generations,” he said.